Demarcation is an animal act. The articulation of boundaries, however, varies from species to species — the scent of urine, scratches on bark, vocalizations, wire cages, glass panels, militarized check points, iron border walls — and in crossing these lines one might transverse the most universal partition, between life and death. Tension and Territory features new work by Lauren Strohacker. 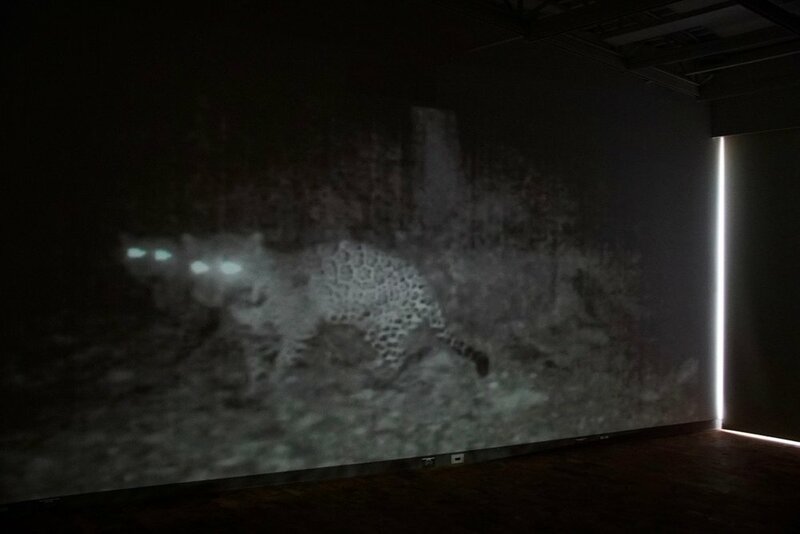 The time-based digital work and public installation is the result of her year-long collaboration with the Northern Jaguar Project and their efforts to sustain, protect, and expand the population and binational habitats of the northern jaguar. Though once prevalent in the American Southwest, the jaguar population has since been decimated in the United States. Arizona is an important transitory space for the species, marking both the northern jaguar’s demise and its possible comeback. In 1963 the last female jaguar in the United States was shot in Arizona’s White Mountains. Two years later, the last jaguar, a male, was killed south of Tucson, completing the extirpation (local extinction) of the species. Beginning in 1996, the iconic, apex predator has been documented in six mountain ranges (Santa Rita Mountains, Whetstone Mountains, Baboquivari Mountains, Tumacacori Mountains, Pajarito Mountains, Peloncillo Mountains) near Tucson. While single jaguars have appeared, there is no evidence to suggest that breeding pairs exist north of the US-Mexico border wall, which creates an impenetrable barrier for the vast majority of Arizona. Other threats include the approval of the Rosemont Copper Mine in the Santa Rita Mountains. The mine’s operation will destroy thousands of acres of viable jaguar habitat in the middle of their crucial movement corridor. Their only hope of recovery is the corridor at the US-Mexico borderlands. 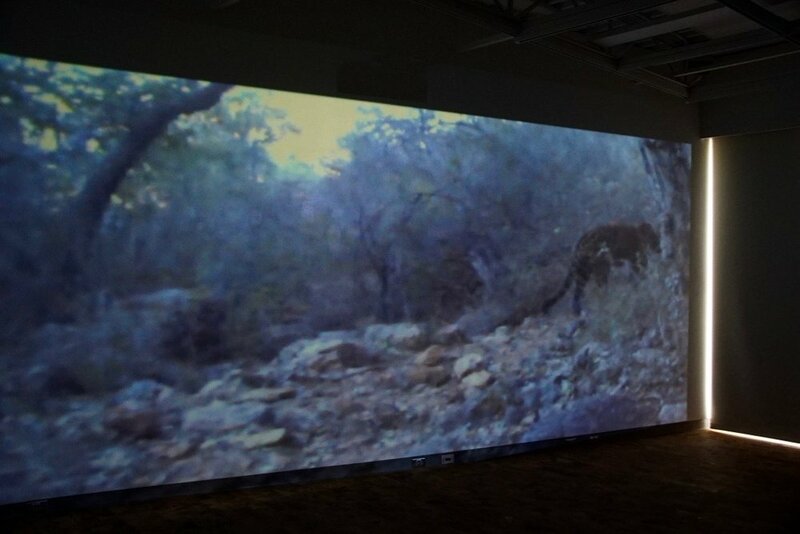 Jaguar images from the Northern Jaguar Reserve and neighboring Viviendo con Felinos ranches projected directly onto the US-Mexico border wall from Douglas, Arizona, United States and Agua Prieta, Sonora, Mexico. Un-Fragmenting / Des-Fragmentando is a temporary public project by eco-political artist, Lauren Strohacker. Made in collaboration with the Northern Jaguar Project (Tucson, AZ), Border Arts Corridor (Douglas, AZ), Casa de la Cultura (Agua Prieta, SON), Conciencia y Educación Ambiental (Hermosillo, SON) and with support of U.S. Border Patrol, the city of Douglas, AZ, and the city of Agua Prieta, SON. "Spread the jaguar's skin, say some Maya, and you spread the heavens of a starry night". 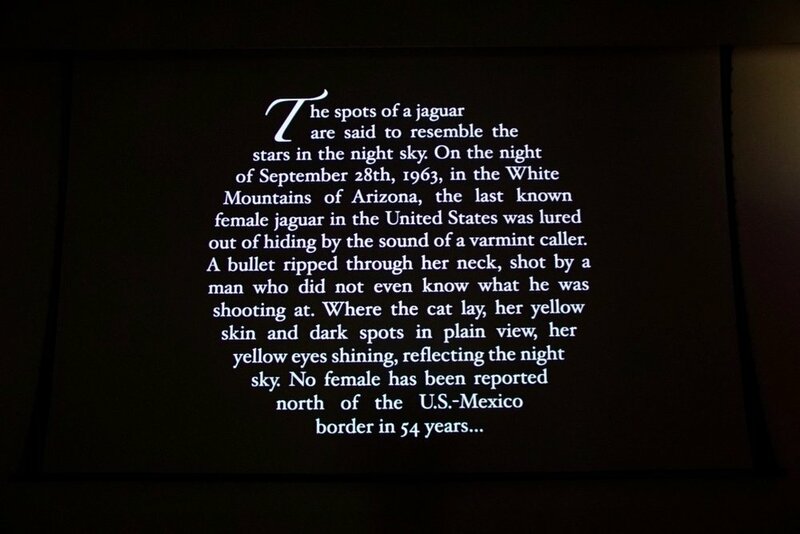 As the sun set on September 28th, 1963 the last known female jaguar in the United States was killed near Big Lake in the White Mountains of Arizona. 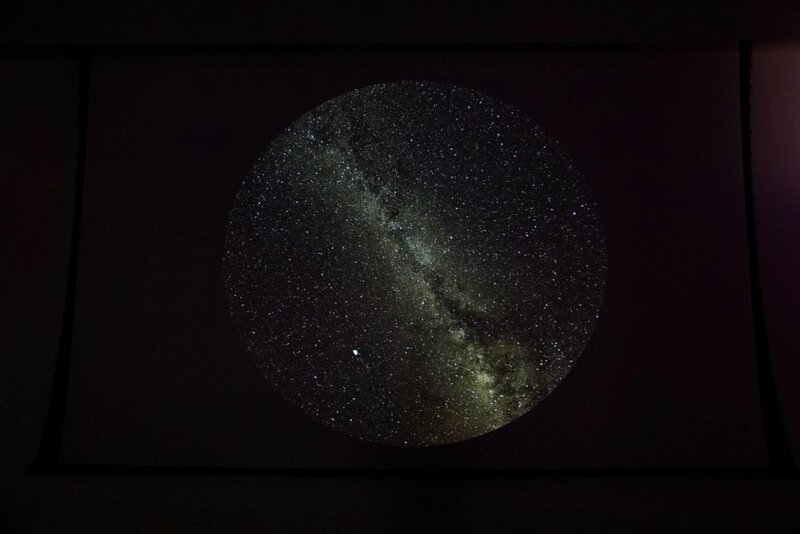 Strohacker and Astronomer, Dr. Kevin Healy, use Digitstar software to recreate this sky using the date and coordinates of the kill, the death time sky is color matched to the last female's pelt. Strohacker records the sounds of a predator caller (which mimics injured rabbits or fawns) from 80 yards away, the hunter’s estimated distance from the jaguar. 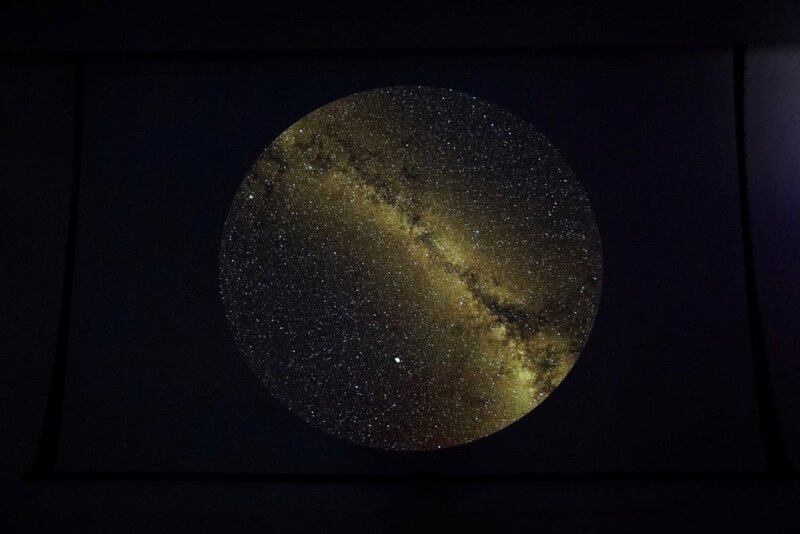 The Mesa Community College Planetarium Skydome is transformed into a memorial, both for her death and the systematic extirpation of the species from it’s North American habitat. Jaguar observed in the wild and in captivity. The former is more elusive, surveilled with motion-trigger cameras on the Northern Jaguar Reserve and Viviendo con Felinos Ranches in Northeastern Mexico. The latter is regularly observable, recorded with iPhone and special permission from the Phoenix Zoo. Two boundaries exist: one visible, in the form of wire fencing and one, invisible, dictated by land ownership and human-designated borders. Within both boundaries, the jaguar is protected yet restricted. Neither is free.